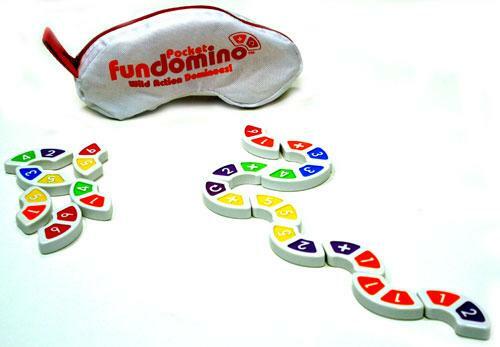 Pocket Fundomino is played with the basic rules of Dominoes but with curvy, s-shaped pieces and the numbers 1-6 instead of the traditional dots. You connect the pieces by matching the numbers and some of the pieces have an icon that provides a little more challenge. A plus sign directs one to pick an extra domino, a star is a wild card and a circular arrow allows another turn. The dominoes are colour coded, even children who have not yet mastered their number recognition may still join in the fun. All 32 tiles can be stored and transported in the easy zip pouch.